The “Your Deductible Status” box on the first page can be ignored as long as the beneficiary remains a QMB. QMBs are protected from paying Medicare deductibles. The box keeps track of deductible payments in case the individual loses QMB status during the year. Service dates on or after July 2, 2018 are affected. MSNs issued in the first three months of the change may include earlier service dates that won’t show QMB payment levels. Nevertheless, QMB protections still apply. The MSN changes apply to Original (fee-for-service) Medicare. Medicare Advantage plans send Explanations of Benefits (EOBs) instead of MSNs. CMS issued guidance to Medicare Advantage plans encouraging them to incorporate QMB information in their EOB notices and in RAs to network providers. We urge advocates to talk with plans in your area about steps that they are taking to implement the CMS guidance. 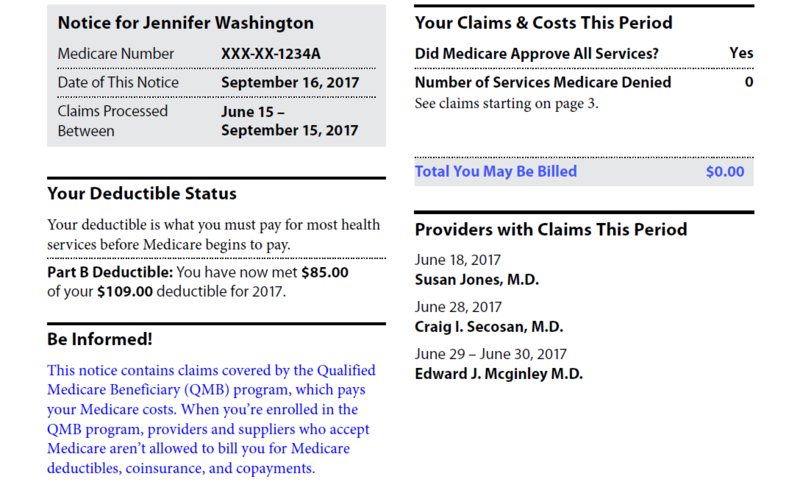 In educating providers who have improperly billed, advocates can use a recently updated Medicare Learning Network article and a helpful Q&A that explains many practical aspects of provider compliance.